From toast to crumpets to bagels, bring your breakfast to life! 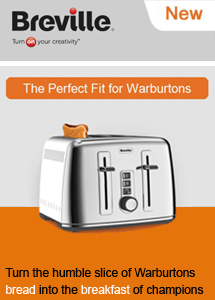 For years toasters have never quite been able to toast Warburtons® bread to the top, despite their toastie loaves being a firm favourite in UK households. But Breville® has got the answer with the new Perfect Fit for Warburtons four slice and two slice toasters, featuring our deepest ever toast slots. Developed with Warburtons® toastie bread in mind, this means you can at last toast to the top. Say goodbye to the white gap at the top of your toast and say hello to fully browned slicesof tasty toast. The quality of your toast will be matched by the quality of your toaster which is build in a high shine durable stainless steel design.